Improve their interpersonal and relationship skills so that they are more effective managers and leaders. Confidently and effectively hold both positive and course corrective feedback meetings with employees. Create a climate of open communication and strong trust. Improve motivation, commitment, engagement and productivity. Reduce human resource-related legal problems. There are three foundational half-day leadership classes and three optional add-on half-day classes. Each interactive class includes a workbook, job aids, and is facilitated by Suzie Price. - Pre-Work: Read several chapters of the assigned book: First Break All the Rules: What the World’s Greatest Managers Do Differently. 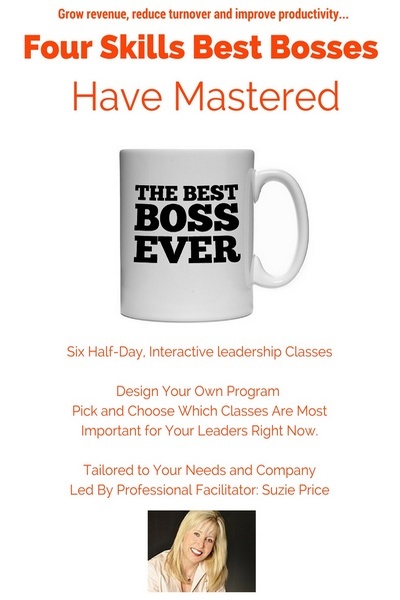 - Learn the Four Skills Best Bosses Have Mastered. - Review of relevant research found in the assigned reading. - Interactive and experiential exercises designed to ingrain the four skills, so that they become a habit. - Triad role plays using the Four Skills of Leadership by practicing with real-work/life situations that leaders are facing. - Development action plans are written and Accountability Partners assigned. - Post-class Assignment: 1) Read chapters in the book, 2) be ready to share at least one example of how each participant consciously used the Four Essential Skills of Leadership at work/home. - Book discussion & exercises. - Review of Four Skills and discussion around examples of how each consciously used them. - Review action plans and Accountability Partner progress. - Learn the Four Step Listening Aggressively skill steps. - Review the Negative Listening Habits. - Video model scenarios reviewed. - Triad role plays using the Listening Aggressively skills steps by practicing with real-work-life situations that the participants are facing. - Post-class Assignment: 1) Read chapters in the book 2) be ready to share at least one example of how each participant consciously used the Listening Aggressively skills at work/home. - Review of Four Skills & Listening Aggressively and discussion around examples of how each consciously used them. - Triad role plays using the Conversation Communication Template skills steps by practicing with real-work-life situations that the participants are facing. - Post-class Assignment: 1) Read chapters in the book 2) be ready to share at least one example of how each participant consciously used the Four Step Effective Discipline and Work Habit Conversation Communication Template at work/home. - Review individual Report results. - Create a Talent Tracker poster and present to the group. - Apply Assessment results to real-life work situations; craft a communication and development plan for their employees and team. - Self-awareness exercises around each person’s individual strengths and potential blind spots/development areas – independent development plans developed. - Review how to avoid the top mistakes all interviewers make. - Demonstrate how they can focus on fit. - Learn how to look for the top interpersonal skills found in top performers. - Practice sessions for holding an effective interview and focusing on fit. - Follow up access to 70 How to Hire Superior Performers email tips for extended, after the classroom learning. - Discussion and experiential exercises about conflict in the workplace. - Learn the How to Resolve Conflict Process for handling conflict between co-workers. - Triad role plays using the How to Resolve Conflict Process skills steps by practicing with a real-work-life situation that the supervisors are facing. The CALL modules are for leaders at all levels, from new supervisors to experienced leaders.